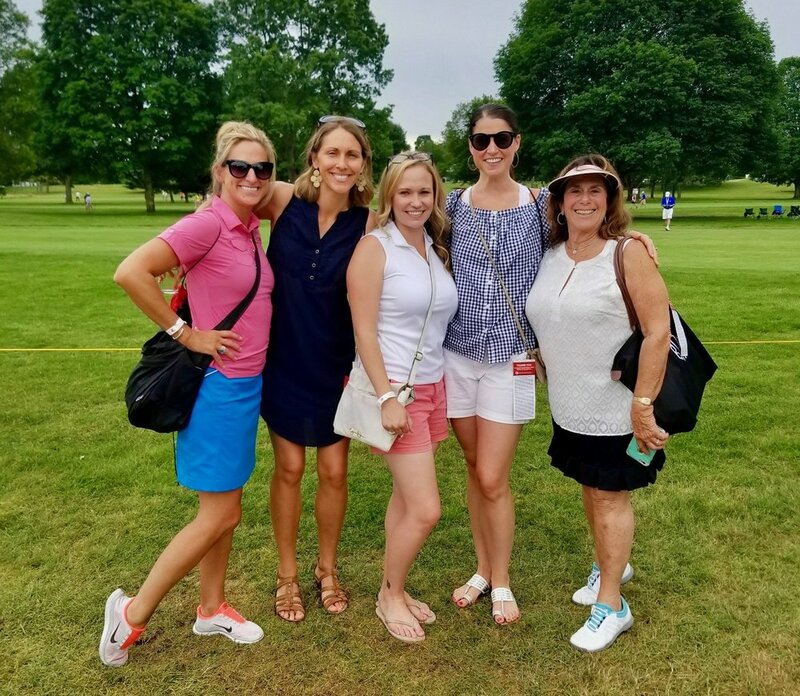 Kladder Update: Back to Work, BBQ & So Much Golf! Thomas Christopher chill'n at the pool. I'm back in the office this week and feeling good! I learned that our video team did a fantastic job while I was away, the kids transitioned well into daycare last week and I'm feeling energized getting back into the swing of things. We're back on the crockpot meal schedule (if you too want to 'crockpot' check out the most recent addition to the GR Family page where we shared our Top 10 Crockpot Meals for Busy Families), I signed up for new grocery delivery service Shipt and we found a fantastic person to help out around the house. Needless to say, life feels pretty buttoned up which makes me a very happy camper! With this great weather lately we've been maximizing our family time together by checking out all the summer events. Last weekend we walked through the Eastown Bizarre Bazaar with friends where we checked out the booths full of art, jewelry, clothing and more. There was live music and a beer tent where we hung out for a while before picking up lunch and heading back to our porch. The event is much like the Eastown Streetfair that happens each fall and makes for a great stroller destination with family. On Sunday we headed downtown after church for the Brews, BBQ & Bourbon Festival at Ah Nab Awen Park on the Grand River. Again, live music and booths but this time full of BBQ, beer and bourbon. The set up was perfect and maximized the river setting and our food was excellent. The bourbon pours, however, were very expensive: $8-10 for a small tasting in a dixie cup. But the event was free and we enjoyed ourselves despite the tiny bourbon portions. Speaking of BBQ, last Friday was the annual Rib Party hosted by the Scholten Family at their home in Grandville. The Rib Party is a tradition I married into with Jeff and has been going for well over 10 years now (since Jeff and his buddies were in high school). We missed the party last year while out of town traveling, but we've made it each year prior since we started dating: 2013, 2014, 2015. Each year it grows in numbers (mostly because everyone keeps having babies!) and each year we stuff ourselves with the best BBQ ribs cooked by the fantastic Mr. Scholten! A reoccurring big thank you to him and the Mrs. for hosting again this year. Us and Jeff's parents at the Photo Booth. The rest of our free time has mostly been spent on the golf course. Two weekends ago Jeff paired with his dad in the Member Guest Invitational, a 3 day tournament at Watermark. They celebrated Father's Day together on the links and smoking cigars. My mother-in-law Mari and I joined them Saturday evening for the banquet and had a wonderful time dancing the night away to the theme of Caddy Shack. That same week I joined the girls from Women's League at the Meijer LPGA Classic at Blythefield Country Club. 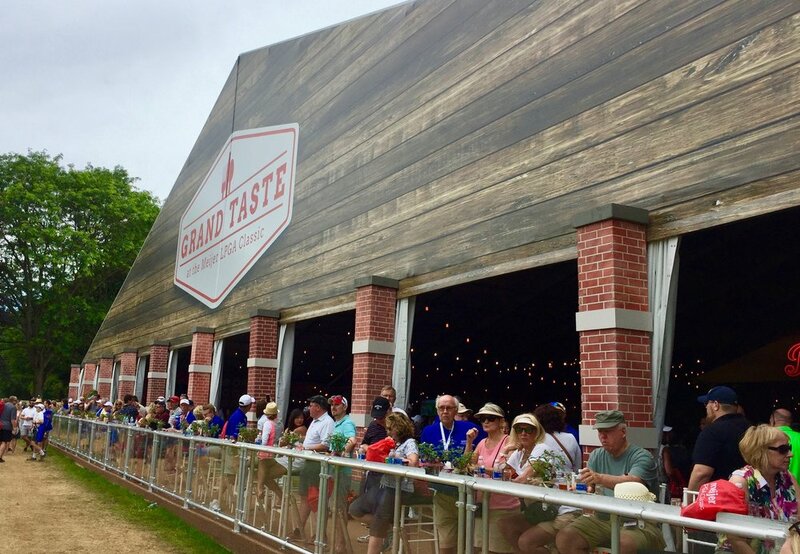 I won't lie that we spent most of our time in the Grand Taste food tent put on by Meijer, but we did walk the course to catch some of the players game. True story, professional golfers two-putt as well which makes me feel a whole lot better about myself. The food tent was packed with vendors serving more than sample sized portions of everything you could imagine. I highly recommend getting tickets to next years event. Completely worth the ticket price. And last week Jamie Kreir and I won our monthly women's league tournament (this months theme: Sail Away!) which basically entails bragging rights and credit to the pro shop that'll likely be used to repurchase all the golf balls we keep losing. For my birthday a few weeks ago I had a private lesson with our golf pro and I can really feel the difference in my swing since. I owe my success to Mick! And this weekend we celebrate BIG time with family for the 4th of July! Hoping for perfect weather and some relaxation. Have a great weekend everyone! Live Music at Reeds Lake - Hey EastGRapidians! Did you know there is live music in John Collins Park each Tuesday evening starting at 7p? Bring your blanket, babies and snacks! The Honest Company Baby Shampoo/Conditioner - Ohemgee... the sweet orange vanilla baby soap smells so good. Thank you to friend Meleah for turning us onto it. Available in a value pack at Costco. Moana & Trolls (the movies) - Kudos to Netflix for keeping it fresh! Both of these kids flicks are available now! We can roll with this cartoon ammo for months with our toddler! Harmony's $5 Cheese Pizza Tuesdays - The patio in Eastown is open, we're taking advantage and you should too! With our girl at live music at Reeds Lake this week.